As our society becomes more reliant on technology, jobs that support those needs increase in relevance, and that includes the need for electricians. Whether the need to keep the highest powered computers running, or just keep the lights on, quality electrical work will be in demand. The most recent Bureau of Labor Statistics (BLS) anticipates the need for electricians to rise. Bolstered by the increase in demand, and increase in wages is also expected. With a mean annual wage of $55,590, and the top 10% making nearly $90,000 per year, the income generated from this style of employment is seen to be competitive. In fact, recent BLS statistics show that those classified as Electrical Helpers, such as some electrical apprentices, can earn a mean annual wage of approximately $30,000 a year. The road to becoming an electrician in the state of Florida starts with education. If you are looking for a more traditional educational route consider the opportunities available through a community college or trade-specific diploma program. These programs can be shorter than most traditional Associates degrees. In those instances, the programs focus on the knowledge, skills and abilities you will need to acquire for a certification or registration in the trade without requiring any extraneous general education requirements that are not deemed absolutely necessary. Some institutions do not require a high school diploma or G.E.D. in order to participate, providing an excellent option for those who may have struggled with traditional academics. Often, you will need to pass a set of basic skills tests to ensure you have the competencies necessary to complete the course work such as minimums for reading comprehension and mathematics. An alternative to the traditional schooling approach is the apprenticeship program, such as the one offered by the Florida Electrical Apprenticeship Association (FEAA). An apprenticeship combines classroom learning with hands-on experience. You will receive on-the-job-training provided by a licensed electrician associated with the program. It will take four years to complete the apprenticeship program, but you do earn a wage while completing the on-the-job-training. This provides a somewhat unique opportunity to earn an education while still providing financial support to your household simultaneously. Apprenticeship programs are generally less expensive than some traditional educational institutions, some only costing a few hundred dollars a year (plus the cost of books), but the requirements to remain in the program are often quite demanding due to the limited number of applicants that can be accepted at any point in time. There are strict attendance rules that must be followed, as well as minimum grades for the associated course work and minimum thresholds for classroom and on-the-job- training hours. Though they may not require a high school diploma to join, you will be required to complete your high school education before exiting the apprenticeship program. Whether you go through a traditional educational institution or an apprenticeship program, you will be required to have a minimum amount of experience before you can apply to become a licensed contractor on your own. While your education may substitute for some of the on-the-job experience, it may not cover all of it. In those cases, you will need to acquire experience while working under an electrical contractor or within a workplace that has you using your new skills. This is where participating in an apprenticeship program may provide an advantage, as working with licensed electrical contractors is part of the program requirements. In many cases, it is wise to complete the formal education first and then join an apprenticeship program. Not only will your general education requirements for the profession be covered more thoroughly, you will have a higher amount of total experience once you are complete with both programs. Completing an apprenticeship may also help you network within your community and may result in employment opportunities through word-of-mouth. That being said, you may choose to continue working at this particular level, as an electrical helper or assistant to a contractor. You may also find that your electrical skills lend themselves well to general maintenance activities, possibly focusing on developing a career within an industrial organization. If that is the case, no additional certifications may be required to continue your career down this path. Generally, additional education and experience are only required if you intend to become a licensed contractor. Once you are ready to become a contractor, you will need to obtain the necessary bonds and insurance to operate. You may also need to obtain a business license if you intend to function in any way aside from an independent contractor. Even if you intend to operate alone, obtaining a business license may provide certain financial advantages in regards to operating costs. You will need to pass a local licensing exam, based on the county, or counties, in which you plan to work initially. This will give you the opportunity to receive your local competency card which attests that you have the knowledge and skills necessary to perform the job functions correctly and safely. As you will be required to produce signed documentation from those who can swear to your competency, this is where the connections made through your education and apprenticeship will provide additional value. Once you have received your local competency card, you can now register with the DBPR, through the Electrical Contractors’ Licensing Board (ECLB), as an electrical contractor and begin working within the jurisdictions in which you are registered. Along with the proof of passing your examinations and the competency cards, you will need to complete an application and pay the required fee. Further, there will be a series of financial and criminal background checks to ensure current positive net worth. If you want to expand into other counties within the state, you will need to complete registration for each one. While some information will be seen as transferable, each must be applied for separately and all local requirements must be met. If you would prefer the ability to work within the entire state without having to register for every jurisdiction, applying to become a certified electrical contractor is likely the best choice. If you would prefer the flexibility to work within the entire state of Florida, you will need to become a certified electrical contractor. In addition to the necessary test scores, background checks, applications, and fees, you will also need to prove that you possess the necessary education and/or experience necessary. This serves as an additional check into competency. Your first step will be to take the Electrical Contractor Examinations through the Florida Department of Business & Professional Regulation (DBPR). You will need to submit an application for authorization to sit for the exams, and pay the associated application fee. Once approved, you can schedule a time to take the exam through the approved vendor, PearsonVue. The electrical contractor exams are administered via computer at select locations, and are hosted as proctored exams. There are two sections including the Technical/Safety section and the Business section, each requiring the small examination fee of $45 and $22.50 respectively. The examinations are open-book. The list of approved materials can be found in the Candidate Information Booklet provided through the DBPR. Once you pass the test, the scores are valid for two years. This means you will have a total of two years available, from the passing of your first exam section, in which to complete your licensing process before those exams would need to be retaken. If you do not pass the examinations the first time, you can apply to retake the exams for additional fees. If you fail the particular test section three times you will be required to complete additional continuing education courses before you will be permitted to reschedule. Once you have passed the required tests, you are eligible to apply to become a certified electrical contractor. Along with a complete application, and the copies of any relevant test scores and local competency cards, you will need to submit to additional background checks to prove solvency and to address any criminal history. Once your application is accepted, you are able to perform the duties of an electrician throughout the state of Florida. Obtaining your initial license will not be the end of your education. In order to maintain a license, you will be required to complete additional continuing education courses. For each licensing cycle, you will participate in 14 hours of approved continuing education. This is to ensure you remain current with any changes in rules or regulations within the industry, such as changes in building codes or permitting processes, along with keeping you abreast of developments in workplace safety, workers’ compensation, or other general business practices. Your license will need to be renewed every two years, where your continuing educational records will be reviewed, along with new checks over your personal and business financials. The only complaint that we have is that Florida doesn’t have as many electrical schools ad what is needed for the population. The good news is if you can get into one of these schools you’ll have a successful career in Florida as an electrician upon graduation. The lack of trade schools means the state isn’t graduating as many electricians that are needed to maintain a healthy supply of employees. Below are just a sample of some of the schools we found. Florida Electrical Apprenticeship & Training trains students in the electrical profession. They are located at 2900 West Oak Ridge Road Bldg 1600 Orland, FL. The electrical program offered is a 1200 hour program that lasts 36 weeks. You can take their day class and they have a Fall and Spring term. They have highly qualified instructors. The campus is at 100 Weldon Boulevard Sanford, FL 32773. At FTC you can earn your electrical diploma in as little as 9 months. Financial aid is available to those who qualify and can be used toward the tuition costs of your electrical training program. Their campus is just off 192 at 3831 West Vine Street Kissimmee, FL 34741. They have been training students for more than 30 years and have flexible class schedules allowing you to still receive a quality education while working. Learn about the NEC code for residential and commercial wiring. Graduates of the electrical training program at Everest College will receive their diploma. 9200 Southpark Center Loop, Orlando, FL 32819. The program requires that you complete 640 hours and 8000 hours of on the job training. It is a 4 year program. 600 West College Dr. Avon Park, FL 33825. South Florida State College is accredited by the Southern Associate of Colleges and Schools Commission on Colleges (SACSCOC). In a recently interview with Trevor Martinez we were able to talk to him regarding what he loves about being an electrician in Miami, FL. Question: How did you get trained to become an electrician? Answer: When I was 30 I decided that I wanted to make a career move from construction into becoming an electrician. I already had my license so I found a local trade school in Orlando that offered a training program that I could completed in under a year. I stayed on full-time and trained to become an electrician and the test was history. Question: Talk to me about your work including your likes and dislikes for anyone thinking about this career. Answer: I love my career and can’t think of a better way to spend my day. I really enjoy working with the group of men and women that I work with each day. When I got hired I ended up working for about a year mainly on commercial properties but over the last 5 years I’ve focused on doing wiring for residential properties that are spec homes. My day starts out at 8am and I typically get off around 6pm depending on how busy I am. Answer: The key is to get started. 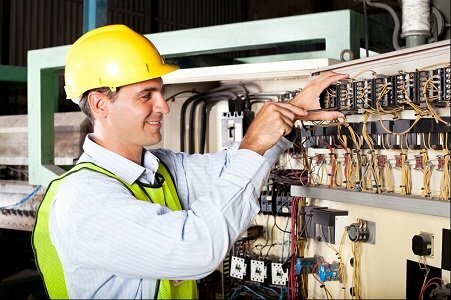 Once you find an electrical training program in Florida that you really like be sure to check them out and make sure they offer exactly what you need when you graduate. Once enrolled do everything you can to learn as much as you can about the industry. I also recommend taking any additional courses that the school might offer that would benefit you in the field. Gaining additional info on solar is a must these days as more and more companies have jumped into providing that service. Question: What are you future goals? Answer: I hope within a few years to own my own electrical business. I have the experience now so it really is a matter of getting the funding to branch out on my own. The industry is pretty massive so good electricians can make a living going out on their own once they can afford to make the leap. In the meantime I’ll be a regional manager in Southern Florida and be responsible for 10 other electricians so I’m advancing my career each year. The key is to stay on-top of industry changes and new technology. Things are becoming so digital, so I can’t stress the importance of really understanding computers and how more effective you can be in your job.